LLVM ERROR: Broken function found, compilation aborted! For my current project I use BuddyBuild for Continuous Integration and Delivery which work remarkably well. Until suddenly the builds started to fail in spite of all unit tests being green and everything building without problems locally on my machine. It took me a while to fix the problem and I am still not 100% sure what the problem was but here is what I did. Normally I would not write a post about stuff I don’t fully understand, but because I could not find anything helpful on Google or StackOverflow about this problem I decided to write a post anyway. Maybe it can point someone with a similar problem into the right direction. Because this error was not occurring when I built the project locally on my machine I had to find out what the difference was when BuddyBuild was building the project. As it turned out the Swift compiler was only crashing when building the project with the Release Configuration. So I could reproduce the crash in Xcode when I build the project with the Release configuration. So far so good. But the problem was, that the error message that Xcode provided when the compiler chrashed was a lot less helpful than the error message provided by BuddyBuild’s log. It basically just tells you that it crashed without telling you where and why. Not good enough to find the problem and fix it. 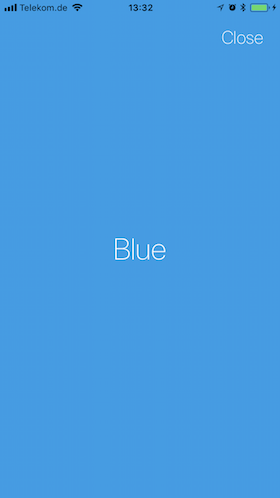 xcodebuild and xcpretty to the rescue! I was able to get the above error message on my machine so I could start to find out what the problem was. So I knew which class was causing the problem but I still had to find what was making the compiler crash. I wish I could tell you a really elegant and clever way how I found the problem but to be honest I had to play the old “comment out all the new stuff and then bring it back line by line until the compiler breaks” game. Apparently using flatMap and directly passing a function as parameter was a bit too much for the LLVM compiler in this case. Which is strange because I do exactly the same in many other parts of the project without any problems. But when I switched to using a closure in this case the compiler crash was gone and everything was building again. As I already wrote at the beginning of this post I don’t really know what caused the problem. I just managed to fix it somehow. So if any of you has an idea what made the compiler crash I would really appreciate your explanation in the comments. Auto Layout and UIScrollView seem to be a popular, but sometimes problematic couple. So here is another post about this topic. This time we will take a couple of subviews, add them to a UIScrollView and make everything work by programmatically adding layout constraints. Because I am a lazy guy, we will use SnapKit (a.k.a. TheFrameworkFormerlyKnownAsMasonry) for the Auto Layout stuff. And because I get bored easily and I have already written a post about a vertical UIScrollView with Auto Layout, we’ll do a horizontal UIScrollView this time. Yay! 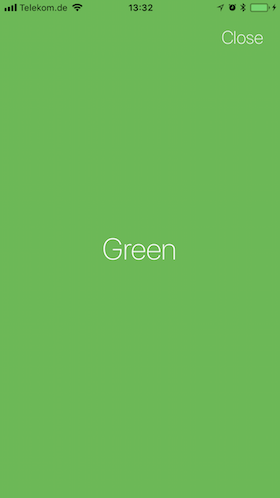 So, let’s take 4 empty UIViews and give them each a different background color, so that we can see the scrolling. To make things simple we make each subview the same size as the scrollview (so each subview covers the whole visible area). And that’s all. When you run this code you can rotate the device to see that the subview sizes and the UIScrollView’s contentSize are adjusted automatically. If you don’t want the UIViews to be resized you just have to give them a static size. 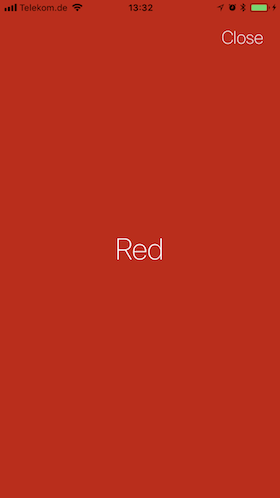 This example also works for a vertical UIScrollView. Just connect the top and bottom constraints of the subviews instead of the left and right constraints. See the blog post I mentioned above for more details. In a previous post I described how to programmatically set the height of a UIWebView to fit the height of its HTML content. The UIView could be something like an iAd that you want to display on top of the web content but that should be scrolled out of the view when the user scrolls the web content. Connect the UIWebView from the nib to an outlet in your view controller. Disable scrolling in the UIWebView. 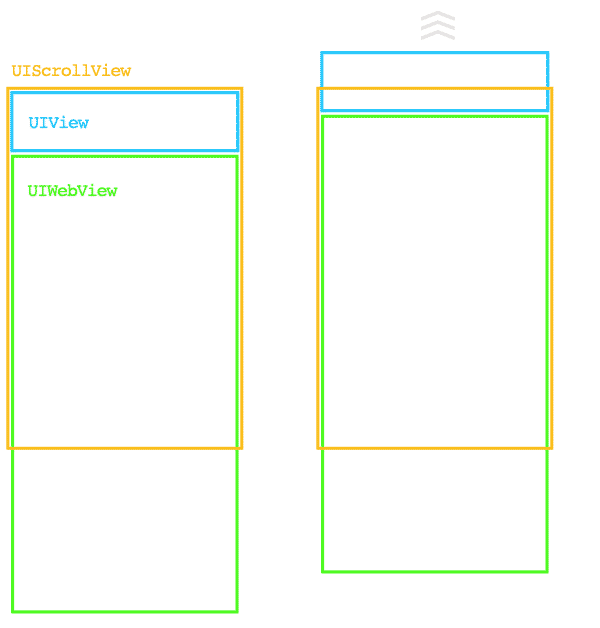 The UIScrollView needs a top, a bottom, a leading and a trailing constraint to the UIViewController’s view. 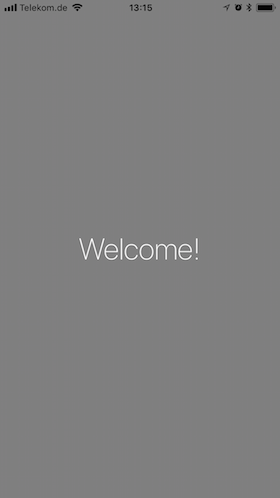 The UIView needs a top, a leading and a trailing constraint to the UIScrollView. It also needs a width constraint that is equal to the UIScrollView’s width to avoid horizontal scrolling (See this post for an explaination). I also add a height constraint, because I want to have the UIView to have a constant height of 100pt. Connect the UIWebView‘s height constraint to an outlet in your view controller. Set the view controller as UIWebViewDelegate. In webViewDidFinishLoad set the height constraint’s constant to the height of the contentSize of the scroll view inside the web view. Start Key-Value Observing on the contentSize to change the height, when height of the web view has to change because segments of the webpage change their size without reloading the page (like accordeons, or menus). Don’t forget to stop observing when the view controller gets deallocated. @IBOutlet weak var webviewHeightConstraint: NSLayoutConstraint! 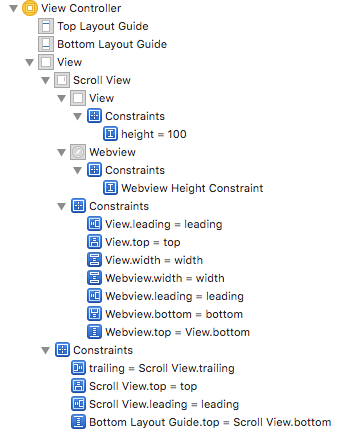 When you have a UITableView with a lot of sections a section index can be very useful to jump quickly between sections. A good example for this is you iPhone’s address book. But sometimes you want to hide the section index until the user scrolls the table view. The problem is that you can neither hide or show the section index directly nor officially access the UIView that holds the section index.